Popular radio station ‘Radio One’ has taken the multiple Tamil radio stations in Chennai by their horns by daringly introducing the city’s First Bollywood Music Station that will cater ‘Exclusively’ to Bollywood Music 24X7. 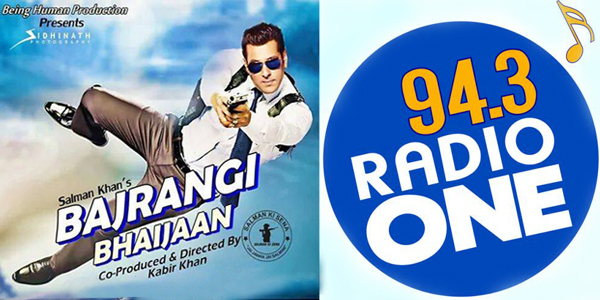 The ‘Radio One’ station 94.3 that was original a Tamil request station has been revamped into 100% Bollywood station from July 7, 2015 with the launch of super hit music from Bollywood Superstar Salman Khan’s upcoming movie BAJRANGI BHAIJAAN. To attract the listeners ‘Radio One’ has also arranged a special screenings of BAJRANGI BHAIJAAN in the city of Chennai for its listeners and customers. “As a result there is huge change in Chennai. There is a growing affluence of ‘retail entrepreneurs’ who love Bollywood as much as they love Tamil music. Movie screens have begun to push both, Bollywood and Hollywood cinema while continuing the best of Tamil cinema,” he quipped.